Despite every attempt to destroy the spirit and hopes of the Palestinian people, life goes on…. The young people in Gaza try to overcome the frustrations and horrors of the war and the siege…. trying their best to survive. They crush the spirit, but they cannot crush our hopes for a future of Freedom and Peace! Awatif Aljadili, 28, made a video for the Israeli rights group B’Tselem about a school trip and students wounded in the Gaza war. GAZA — In the year since Israeli fighter jets and troops invaded this coastal Palestinian strip to stop rocket fire, time seems to have stood still. A blockade imposed by both Israel and Egypt to isolate the Hamas government bars the vast majority of goods and people from moving in or out. That means there is no reconstruction of destroyed buildings. Thousands remain homeless. Winter has arrived. With humanitarian aid staving off hunger and disease, perhaps the hardest part for people here is the feeling of having been forsaken. The economy is closed down and the exits have been shuttered; a pall of listlessness hovers. But there are thousands of stories in the wake of the war and in the face of the blockade. The Israeli human rights group B’Tselem decided to do something about getting them out, especially to an Israeli audience. Months ago it distributed video cameras to 18 young people in Gaza and set them up with an instructor and Web guidance. The assignment: tell us about your lives. The result is a series of short subtitled videos on a variety of topics: working in the smuggling tunnels from the Egyptian Sinai, how the wounded are doing, a profile of a girls’ soccer team. Israel’s biggest news Web site, Ynet, which belongs to the Yediot Aharonot newspaper group, has just posted five of the videos under the headline “Gaza: An inside look.” Because so little from Gaza makes it into the Israeli news media — Israeli journalists, like all Israelis, have been barred by their government from entering for more than three years — this is something of a new frontier. The site’s first video, called “Protest Song” by Mohammed Fares, shows Ayman Maghmas of a group, Palestinian Rapperz, explaining to a Gaza audience the role of rap and hip-hop as a means of protest. Mr. Maghmas, who wears a T-shirt that says in English “Hip hop is not dead. It lives in Palestine,” lost his father and apartment in the war. He explains that just as African-Americans use rap to denounce oppression, so can Gazans express their suffering through it. Over the words are scenes of some of the destruction from the war. Mr. Fares, 22, who made the video, is from the Jabaliya refugee camp and is studying English. He says that he believes in nonviolence and that he sees the videos as a way of reaching out to Israel and the world. 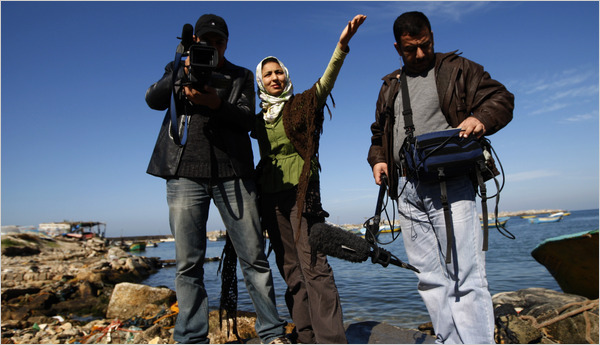 Awatif Aljadili, 28, a Gazan who works as a television producer, said that was exactly the kind of response she was seeking. She made her video about a field trip of a girls’ school and what it is like for a couple of the pupils who were wounded in the war. The girls sing songs about eating well and taking care of their teeth and then about how they too want to live normal lives like those of children the world over. One of the most interesting videos brings viewers inside the smuggler tunnels through which most consumer goods are brought into Gaza. Young men are asked why they work there, and they explain that there is no other source of work. They add that they always pray before going down into the tunnels because there are so many accidents and deaths inside them. The maker of that video, Rifaat Hamdia, 30, said he wanted to show the world that the tunnels many think of as dedicated to Hamas arms smuggling are actually the source of basic goods like cooking oil and detergent. Mr. Hamdia went into the tunnels while filming and knows them well. He also has another reason to feel special attachment to the tunnel network: his bride from Jordan was recently smuggled through one. It was brought to the attention of all B’Tselem supporters.